Tryout the best juice cleanse delivered to you! Ready To Try The Best Juice Cleanse? Get Your 3 Day Cleanse Here! When it comes time to make your detox decision, remember your JuiceFresh cleanse is made with only 100% organic fruits and vegetables and we have been delivering the best juice cleanse available for six years. 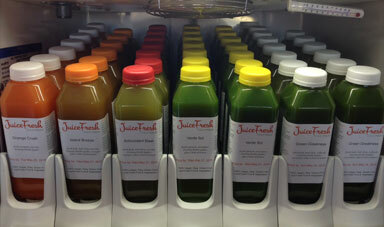 Thousands of satisfied customers understand that the best juice cleanse starts with the best juice. Never frozen. Never high pressurized, pascalized or pasteurized. 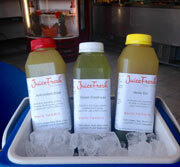 JuiceFresh is simply the best tasting, most powerful, raw, vegan 3 Day Cleanse you will ever experience. Whether it's the quiet joy of a peaceful home or the increased focus on the challenges of your career, teaching our bodies to be healthy, happy and wholesome is exactly what your detox juice is all about. Making up your mind to nourish your body now with micronutrients while breaking free of bad fat and toxins will renew your spirit for whatever life has in store for you. Some challenges are worth it, this one is one of them. Increase your energy level while you detox your body with the super abundance of the freshest fruits and vegetable juicing. Best taste, 100% natural with amazing benefits that fresh organic nutrients will bring to your body, mind and spirit. Detoxification is a word that can be found in the community of nutritionists. They embrace this natural "medical treatment" because you can naturally remove toxins accumulated in our body, without affecting your energy level. Would you enjoy getting your juice for FREE! 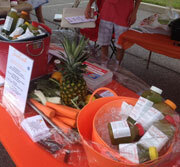 Would your friends enjoy FREE samples of JuiceFresh? Let JuiceFresh bring the party to you! Learn more here. Are you interested in earning extra money while sharing healthy nutrition ideas with others? 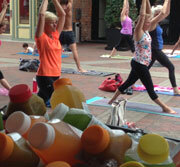 Find out more about our exciting JuiceFresh Wellness Ambassador program here. 3. Are You A Wellness Professional? Partner With Juicefresh. 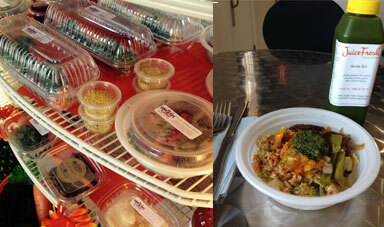 Health, wellness and fitness professionals know that nutrition is key to their clients healing and success. Learn more about how a JuiceFresh Partnership can benefit your clients and your business here. You will love what fresh juicing will do for you! In the video above, a businessman from Australia by the name of Joe Cross has likely done more than any other single person to bring the reality of the power of juicing to the public. Watch this extended trailer for Joe’s documentar which is titled Fat, Sick & Nearly Dead. Looking for encouragement on your juice journey? Click the link below for other helpful health/wellness videos. It's time to get your juice on! 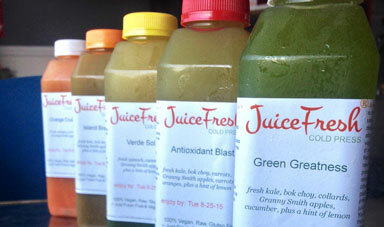 Juice Fresh now offers home delivery on your 3 Day Cleanse. We deliver throughout the Eastern U.S. (21 States) and your cleanse is guaranteed to arrive cold, fresh and ready to enjoy.